To all, thank you for all who participated and those who supported our Dental Mission trip to Rio Grande province of Puerto Rico. Dr. Craig Q Adams and Restoration Community Church organized this trip to serve the population of Rio Grande and surrounding areas. 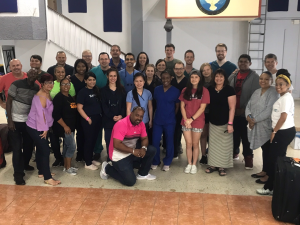 Dr. Craig Adams DMD (Raleigh), Dr. Robbie Taylor DMD (UKCD faculty), and Dr. Patrick Campbell DMD (US Army) supported 12 student dentists from University of Kentucky College of Dentistry (UKCD) in furthering their education during their Spring Break!! Our team served over 325 patients and performed over 1200 procedures. Pastor Robin Phillips (Restoration Community Church) and Pastor Jesus Figueroa (Rio Grande) led our group spiritually throughout the week. Fifteen men and women support staff worked from the most menial tasks, to dental assisting, sterilization, set up / breakdown, and loving on patients. We also were blessed with countless local support officials and giving hearts to help translate and work in the clinic. This Clinic would not have been possible without each and every volunteer and supporter. During these mission trips, lives are changed. The lives of patients and their families are greatly impacted by the services we provide which would otherwise go unattended. There is a great sense of pride in the community along with our host church, Centro Cristiano Batel. Puerto Rico is, in my opinion, a second world country (U.S. province) with third world pockets still vastly destroyed by Hurricane Maria. It is important to understand that the lives of participants involved with a trip like this are all changed significantly along the way as they serve altruistically. Daily devotionals, accompanied by personal bonding within the group of servants, create an amalgamation of “team” to serve and be served. There are multitudes of special moments, conversations, a deeper understanding of self and purpose of life. Laughter, love, tears, hugs, sharing experiences both past and present are enriching to each and every team member. The incredibly difficult and physically demanding work of “Mash Dentistry” in a make shift clinic is exhausting but satisfying. The growth of clinical skills of all the dental students is like spring blooming in front of my eyes. Each and every day sees volumes of growth in these student dentists’ clinical abilities and confidence. May the blessed ripple effect both down in Rio Grande and in our personal lives continue to affect all our lives in a positive way and support our faith in God’s master plan. Eph 2: 8-10 For it is by grace you have been saved, through faith – and this is not from yourselves, it is the gift of God. Not by works, so that no one can boast. For we are God’s workmanship, created in Christ Jesus to do good works, which God prepared in advance for us to do.